Ever take off on a long flight, only to remember an important message or an email you forgot to send? Not to mention the worrying while inflight or apology you’d have to craft for not making your deadline? Here’s some good news – among the many things you’d miss when you go on a trip abroad, connections no longer have to be part of them! Unlock your phone and latch on to myPAL Wi-Fi Hi-Speed, discover why staying online while onboard has never been this fast and convenient. Leave your loved ones some peace of mind. No more radio silence between your “Hey, I’m already in the plane!” and your “Hi, I just landed!” texts. Access your go-to messaging apps while inflight, sending those awaited updates to the ones who matter the most to you. Never miss a beat. Worry no more about losing your office momentum—access your emails and your important files in the skies and use that valuable travel time to your advantage. Imagine that: while you’re high up and flying in comfort, you could get work done as well! Post fun times in real time. Took a funny video as soon as you settled into your seat? Post it on your Stories! Captured a photo of your delightful inflight meal? Load it up on Facebook! Why wait until you land to share your Philippine Airline experience? Make sure your accounts are updated with the cool things you encounter, even while inflight! Customize your onboard fun further. Sure, your PAL flight already comes with an amazing range of shows to binge on and music selections to sound trip to – but sometimes you just need to browse and search for your specific type of content. Go ahead and surf your go-to websites with internet speeds that rival your regular on-ground connections. Long flights don’t have to feel long. 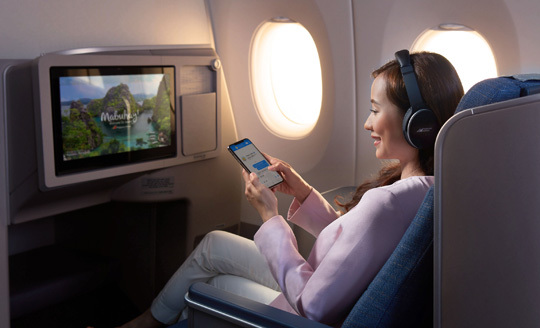 With myPAL Wi-Fi Hi-Speed’s complimentary 30mb for all passengers and 100mb additional for Business Class, staying connected doesn’t have to stop the moment your flight takes off. The same goes for when you hit your data cap. Easily renew and top-up an additional 100mb for only USD5, payable onboard by credit card. Fly the way you deserve and surf to your heart’s content with Philippine Airlines – and learn all about this speedy new feature on philippineairlines.com. Philippine Airlines is the national flag carrier of the Philippines, proud to be the first and longest-serving airline in Asia under its original name since being founded in 1941. Philippine Airlines is a full-service scheduled airline whose fleet of 85 aircraft operate flights to 33 destinations in the Philippines and 40 international destinations in the United States, Australia, Canada, the United Kingdom, the Middle East, New Zealand and all over Asia. It also serves an additional 41 destinations through codeshare alliances with partner airlines. Philippine Airlines recently received a 4-Star global airline rating from Skytrax, the international air transport rating organization, having proven excellence and commitment to world-class standards across Skytrax’s global metrics that measure product and service quality.